We needed to correct an unsafe practice in our blending area — using a forklift to raise and then hold a tote in place while we pump ingredients into our blending tanks (see drawing “a”). Corporate engineering proposed an automated design with six tanks with valves on the top of each tank (drawing “b”) that would cost about $49,000. I thought this was a dumb idea and one for which we’d never get funding anyway, so I had maintenance simplify the design (drawing “c”). We don’t need valves on top of the tank; we’ll control the weight added with a valve near the pump. Because we don’t need valves, we ran individual pipes to each blending tank. What does corporate engineering know anyway? Figure 1. High readings from a level transmitter prompted operators to rely on alarms for control. In the U.K., all totes (we call them IBCs — intermediate bulk containers) carrying liquids are designed specifically to be transported around using forklift trucks; they have slots underneath the framework for taking the forks of forklifts. Drivers must be appropriately trained in order to drive a forklift truck — this helps reduce the chance of human error. I can recall having seen liquid being drained from totes lifted by forklifts, but only very rarely. Most totes/IBCs are drained from a ground-level position or on top of one another, so they do not need to remain on the forks of a forklift truck. I would not advocate draining a tote while lifted high on a forklift truck — except perhaps for nonhazardous liquids. At a low height for hazardous liquids yes, but not from a [more-than-minimal] height — for safety reasons. Placing the tote at [the necessary] height on a frame regardless of the contents would be the safest approach. A pipe without a valve at the end will drain all its contents into the blending tank up to the first static height above the pump. Except for the inaccuracy of weighing, this isn’t a problem with the unsafe operation because the liquid forms a static column above the lip of the tank. This is an argument for making the line as small as possible. A 1-in. Sch-80 pipe will hold 0.037 gal/ft; a similar 2-in. pipe holds 0.153 gal/ft. Given the maximum extension of a forklift of about 14 ft and a run of perhaps 10 ft, that’s about 1.53 gallons draining into the blending tank. The vertical 14 ft won’t flow into the tank. Assuming the density of water, that’s 8.34 lb/gal or 12.76 lb/10-ft. That’s a problem. Here’re some ideas for fixing this problem inexpensively: 1) install two valves per blending tank — a block valve and a vent/bleed; 2) add a centrally located return line with a hose connection — this will allow circulating solvent or hot water to clean the pipe in a loop back from a cleaning tote. It’s best to automate operation of the block valve rather than having an operator manipulate it. The bleed, upstream of the block valve, serves as an air vent to pump the ingredient back to the tote after ingredient addition. I recommend automating the whole process to improve accuracy. Based on my calculations, you’ll have to keep the temperature below 140°F because of manufacturer limits; CPVC would allow 200°F, hot enough to melt many waxes. As for problems with high viscosity ingredients, I think you’re stuck. You will have to use two pumps in tandem — one on the floor near the tote and a booster pump on the mezzanine. Otherwise, you’ll have to consider something other than an air-operated diaphragm pump — perhaps a gear or lobe pump. There’s also another problem: splash filling flammable, nonconductive liquids. Dropping liquid from the top of the tank is a bad idea. At least the corporate engineer’s design had dip tubes. Lastly, I question the plant’s concern for project cost. Let’s consider this: Assuming that operators make lifts with forklifts ten times a day and the plant blends 300 d/y, that’s 3,000 lifts per year at which operators are at risk. If we only talk about injuries, and not fatalities, the cost is $39,000 per injury according to the National Safety Council – and that’s if nobody sues the company! The frequency of an accident with chemicals is 0.00486 (“Chemical-related Injuries and Illnesses in U.S. Mining,” D. F. Scott, E. M. Merritt, A. L. Miller and P. L. Drake., NIOSH (2004)). So, let’s consider two people injured in a spill: 2×3,000×0.00486×$39,000 = $1,137,000/y. I bet I could gold-plate this project and still show a fantastic rate of return. Based on straight-line depreciation, a 10% interest rate, zero salvage value, and a service life of 10 years, I get a rate of return of 2,300%! Some companies are penny wise and pound foolish or, perhaps, they think they can get away with neglecting worker safety. What they don’t know is that OSHA investigates the entire facility when there’s a serious accident: oops! Our refinery suffered an incident that nearly led to a fire. 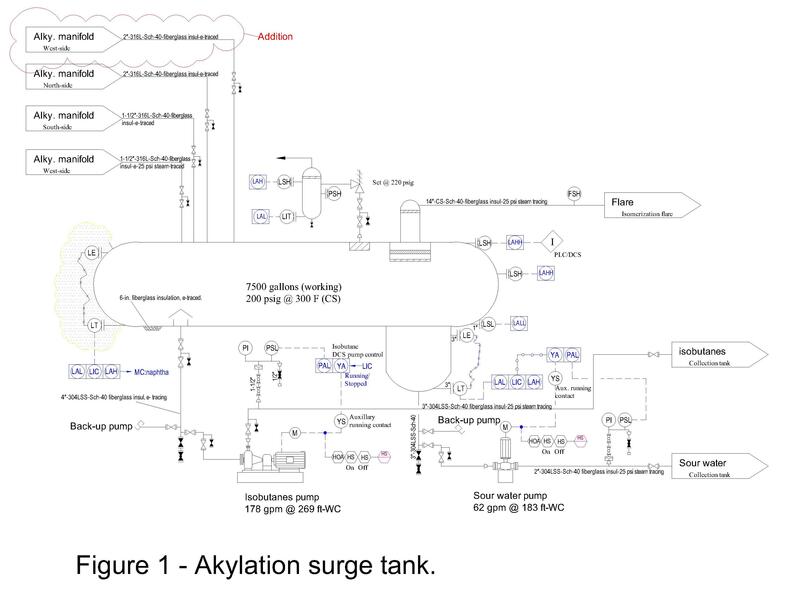 It occurred after the board operator started the isobutanes pump on an alkylation unit surge tank (see Figure 1). The pressure safety valve popped, the flow switch in the vent tripped and so did the unit interlock on the high-high level switch. This happened while a field operator was busy walking down one of the alkylation towers looking for leaks. That operator remembers the light on the pump station being off and assumed the low-level switch stopped the pump. I work in a different part of the refinery and have been assigned to investigate the incident. I found the hand-operated actuator set to “off” instead of “hand” as the field operator was instructed. The display in the control room is supposed to show the pump in gray when it’s in off or hand mode to indicate that the board operator isn’t in control of the pump; the board operator doesn’t recall it being gray. This problem involves a larger issue, though. Both the board and field operator don’t trust the automatic controls: the dP level transmitter always reads high. The board operator has compiled rough records of level based on flow meters that indicate a disparity. During the last turnaround, two years ago, the operator complained that he and the instrument technician thought the dP’s dry leg (upper) element was in the wrong place. Nothing was done then — our refinery was bought by an investment bank four years ago and maintenance has gone downhill — and the tech doesn’t work at the site anymore. So, the board operator relies on alarms from the high and low level switches — and gets the field operator to manually shut off the pump in the case of a low-limit-level warning. Both operators had complained to their new supervisor about the problem and were told it would be addressed during a turnaround in six weeks. Now, rumor has it the superintendent is blaming the field operator for not being more careful. I don’t want to rub the superintendent the wrong way; he’s politically powerful. How should I approach this problem? What do you think the root cause of this incident was? Send us your comments, suggestions or solutions for this question by December 12, 2016. We’ll include as many of them as possible in the January 2016 issue and all on ChemicalProcessing.com. Send visuals — a sketch is fine. E-mail us at ProcessPuzzler@putman.net or mail to Process Puzzler, Chemical Processing, 1501 E. Woodfield Rd., Suite 400N, Schaumburg, IL 60173. Fax: (630) 467-1120. Please include your name, title, location and company affiliation in the response.